Why do people seem to pretend that manga is the first comics market to thrive outside the auspices of the Direct Market? Comic strip collections have managed to thrive in mainstream bookstores for years, serving their own unique audience, without ever being the subject of a string of essays about what Marvel's doing wrong vis-a-vis Dilbert. After the scene by scene report gets the rest of the way up to speed, what do you think this site should pursue as its next resources project? A listing of university and museum holdings in North America? A chat room? A bibliography section by author? Ongoing critical projects like "Top 100 Superhero Stories" or something? 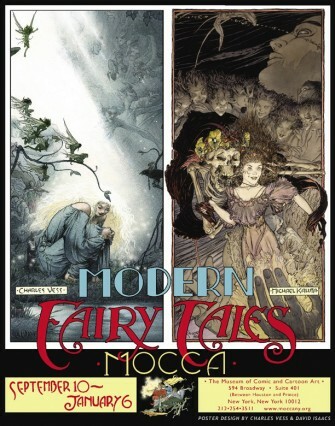 I have a hard time keeping track of events sponsored by the Museum of Comic and Cartoon art, and my eyes tend to glaze over on art exhibits generally, but Charles Vess sent along the above poster and the description below of a show he's doing with Michael Kaluta, and I realized I would really want to go look at this were I in New York this Fall. Of special interest to me would be the charcoal drawings. Michael and I are exhibiting 25 pieces each. My work includes two complete stories from The Book of Ballads, several misc. pages from other stories in the collection, two large (4 x 8 ft) charcoal drawings and the cover to Stardust. Kaluta is showing several pieces from both his Tolkien and Celtic calendars as well as covers to misc. books. The exhibition will run through January 6th of 2006. I doubt people still take Fall trips to New York to go Christmas shopping and see plays the way they might have in the 1940s through 1970s, but this would be a great thing to step in and scope while in town on just such a journey. 1. Is there honestly that much common ground shared by working and wannabe creators? 2. Do you ever get the sense that when discussing industry issues, people are severely limited by only being able to conceive of an industry in which they play a vital role, both creators and pundits? 3. Why do comics folk almost always prefer grand, clever solutions that ameliorate or mitigate against problems rather than confronting and reforming them? While I'm mentioning art shows, I'd also go to see this Ganzfeld one at Junc Gallery in Los Angeles, curated by Dan Nadel, were I in Los Angeles. Between this link provided by Gus Mastrapa and this write-up by Graeme McMillan at Fanboy Rampage, you should be able to track Mr. John Byrne's tussle with Wikipedia, if you are so inclined.